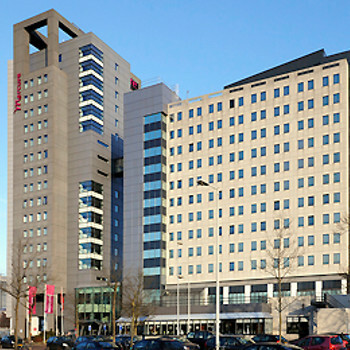 The Mercure Aan De Amstel is a contemporary 4 star hotel that sits beside the Amstel river on the south side of the city. We done Amsterdam on a long weekend Coach tour. The Mecure Amstel hotel was ideally situated for this purpose with easy access to main arterial routes. Easy access to the very clean and reliable tram system a 10 minute walk away and then a 10 minute ride straight into the city centre. Key card access to rooms also worked lifts - no card and the lift would not go. Security system only allows guest to get out on their floor. Twin bed room spacious and very clean. We were on 9th Floor - very quiet with views out across Amstel river and adjoining canals to clean industrial estate. All the expected services in room. Good sized bathroom. Adjoining rooms both occupied but no 'through the wall' noise from other guests. Breakfast buffet excellent. Extensive choice, Well presented with quick and effective table service - removing used plates, refreshing tea and coffee etc. We ate on 2 occasions in the bar (did not use restaurant) as we only wanted a lite bite. Food was well presented, tasted really good and in generous portions. Reception staff were good - able to advise on next day weather, taxi's trams and buses. On the Sunday night the staff were having their Xmas party (in May!) and the hotel was run by Agency staff. If I had not been told I would not have noticed the difference. I will certainly recommend to friends and family.